This richly illustrated book provides an innovative reinterpretation of the Cultural Revolution through the medium of the poster—a major component of popular print culture in China. Using thirty full color and as many black and white reproductions of posters from the University of Westminster collection, an eminent group of scholars explores the discursive power of visual artforms in Chinese public life (Rowman & Littlefield). 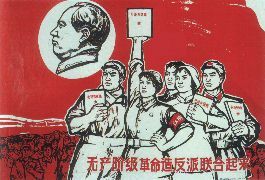 The time of the so-called Cultural Revolution, 1966 - 1976, was a tragic and turbulent time in China, with millions of people uprooted to work in the country as farmers, and an extreme form of communism enforced by terrorist	youth gangs, the Red Guards. It is not clear if this was a revolution within the revolution, initiated by Mao, or a power struggle for his succession, but it ended with Mao's death in 1976 and is today officially labeled Ten years of chaos. It brought with it a production of posters of staggering proportions: The famous picture of Mao going to Anyuan by Liu Chunhua is said to have been printed in over 900 Million copies. Some were exported to Europe where they were greeted with enthusiasm. I remember my own excitement when I saw some of them, although I had no sympathy for any sort of revolution, nor did I have a clue of chinese politics. When the nightmare was over, most of these posters were looked upon with disgust in China, and were quickly forgotten in the West. I was rather surprised to learn, in 1994, of a PhD thesis and subsequent book by Stefan Landsberger on chinese posters. The subject has seen a veritable revival in the meantime, and the present book is the latest testimonial to this trend. It consists of essays by Harriet Evans, Stephanie Donald, John Gittings (to whom we owe the collection of 500 chinese posters on which the book is based), Craig Clunas, Xiaomei Chen, and Robert Benewick, who all have longtime experience with China, if not with posters. The quality and readability of the different contributions is uneven. Some, like Xiaomei Chen's account of her childhood in China, are clear, informative and substantial. Others are best enjoyed if you are familiar with terms like scopophilia, locution, Tridentine hagiography, visual imbrication (flunked the test? me too). However, the book contains a wealth of information, both on individual posters and on the context in which we have to place them, but there is no index of poster designers. Some items are amusing like the story reported in a local newspaper about a model peasant who decorated his home with 32 Mao posters so he could be inspired by the great helmsman in all directions. It was later discovered that his true reason was that posters were the cheapest available form of wallpaper. The poor journalist was promptly branded a counterrevolutionary. Also denounced as straying from the right path was poster designer Huang Yongyu who dared to paint a winking owl, thereby implying a hidden disrespect for socialism. Don't laugh! This kind of far fetched image interpretation is not only practiced in China, but also elsewhere, for example on p.69 of this book: The two feminist editors consider the picture of a female power line technician (see below) possibly degrading to women, because she proudly wears a badge of Mao Zedong, a notorious male. The book design of this volume is as outdated as in many other academic books. You need more than one finger to read it, as the "footnotes" are at the chapter endings, the color plates between p.82 and p.83, the black and white illustrations scattered throughout, the list of figures on p.145, and many posters that are discussed in the text are not even illustrated. It can be recommended as supplementary information for the specialist, but if you are new to chinese posters I would advise you to go to Stefan Landsberger's web page, and you may be as overwhelmed by their visual power as I am. Whether this is politically correct is another question.